While these Stretch Tuesdays only roll around once a week (and every third week for the BugDoc), they still seem to come really fast. I can imagine what Dr. Glass, Brian and Galen must feel when they have weekly and nightly tasks! Tonight, I’m going to dive into the candleholder area! I know there are a lot of candleholder collectors out there, so this is a true cross-over field. Personally, I like candleholders because they take up little shelf space compared to bowls, comports and plates. However, I have one complaint against “purist” candleholder collectors! Many want just one! That means when they get a pair, they sell the other one. Ouch! For those of us who like to get them as originally designed, pairs to go with settings, this makes us spend extra time trying to find matches for the singles we find! I remember visiting Doug Archer’s shop (author of one of the Imperial books) many years ago and I saw single candleholders on every shelf. When I asked “Where’s the other one?” he answered “In my collection!” The world of collecting is interesting!! 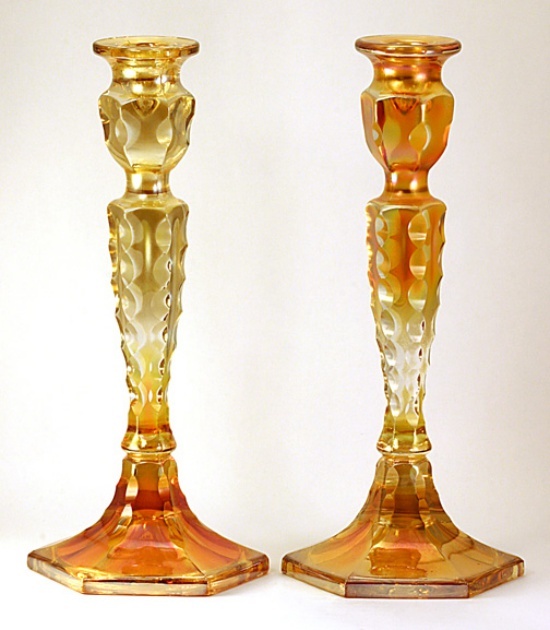 Tonight, I’m going to start with the candleholders that most collectors and dealers call “Colonial.” These are the graceful, hexagonal holders that have a candle cup that is attached to the stem with a narrow constriction; the stem slowly tapers down to the foot where there is a slight widening or a ball shape before joining onto the base. Most people know that Fenton and Northwood made these holders in iridescent colors that were included in their stretch glass lines. However, Vineland Flint Glass in Vineland, NJ also made a 10-inch version. The Fenton and Northwood holders are either 8 or 10 inches tall. Fenton’s 8-inch holders are #449 and the 10-inch ones are #349 (the smaller ones are actually in the 8 ½-inch range and the larger ones are 10 ½-inch). Northwood’s 8-inch holders are #695 (actually 8 ¾-inch) and the 10-inch ones are #696 (actually 10 ¼-inch). Any of these candleholders can vary, plus or minus, ¼-inch depending on the foot being pushed down or not. Both Northwood and Fenton candleholders were made in a two-piece mold, so there will be two mold seams that are most visible at the holder cup. Fenton has a slight slope out where the stem meets the foot while the Northwood version has a ball shape at the junction. Vineland’s candleholder is a dead ringer for the Fenton candleholder, except they used a three-piece mold. Thus, you have to look closely to see if there are two or three mold seams! For collectors who like to accumulate all the versions of these candleholders, you will likely spend a lot of time (and money) getting a complete collection! Virtually all the Fenton stretch colors were used, but Velva Rose, Aquamarine and Tangerine examples (only known in the 8-inch versions) are tough to find. Also, we have not seen Royal Blue (dark cobalt) examples. Celeste Blue, Topaz, Florentine Green, Persian Pearl, Wistaria (sic), Grecian Gold and Ruby are fairly common, but Ruby examples always command top prices. To make things more interesting is that the Fenton holders can also be “decorated” with cut ovals (factory cuttings) or with acid etched designs with gold trim (secondary decorating factories). 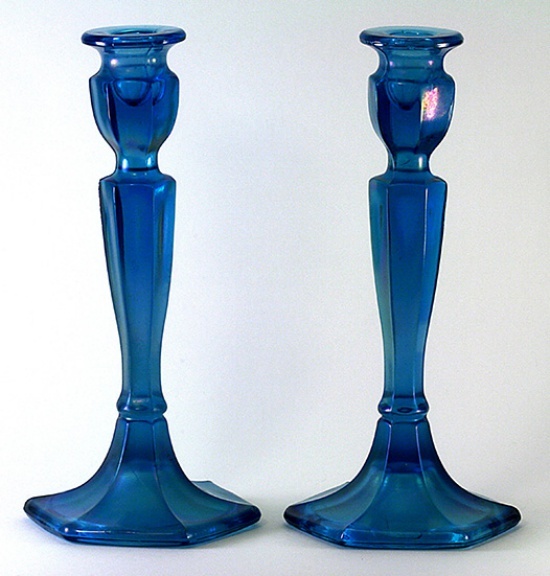 Northwood’s candleholders are most commonly found in marigold, Topaz, and Blue (both a Celeste Blue type and a sapphire blue type), but Russet (olive-green-amber) and Jade Blue (opaque blue) ones are obtainable. It would be conceivable that candleholders in this shape exist in custard and even opaque white, but none have shown up so far. Northwood’s candleholders may have gold trim at the top and bottom (likely factory decoration), glue chip decoration (likely factory decoration) or with acid etched designs on the base (secondary decorating companies). 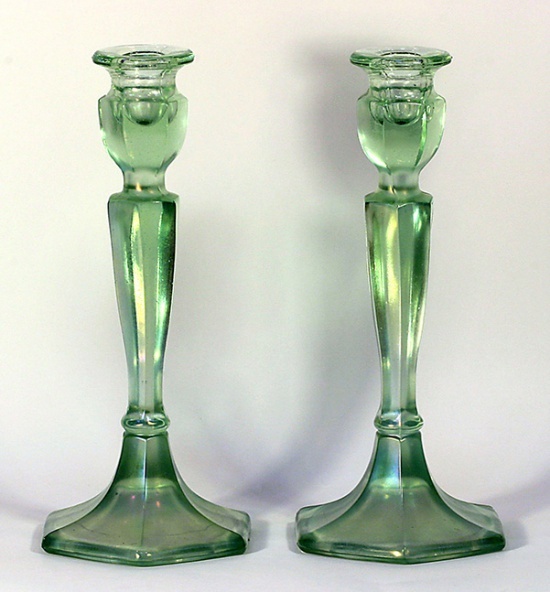 The Vineland candleholders are always in “unique” colors as the company seemed to have poor standards for their glass colors. They are generally Tut Blue (which can range from light to dark blue), Wisteria (usually a very dark purple), light green (which we often refer to as “coke bottle green”), or Old Gold (a medium to dark amber glass). However, holders are known in a “dirty” pink and even a caramel slag color! If you have some unique colors and/or decorations, send us some pictures! !